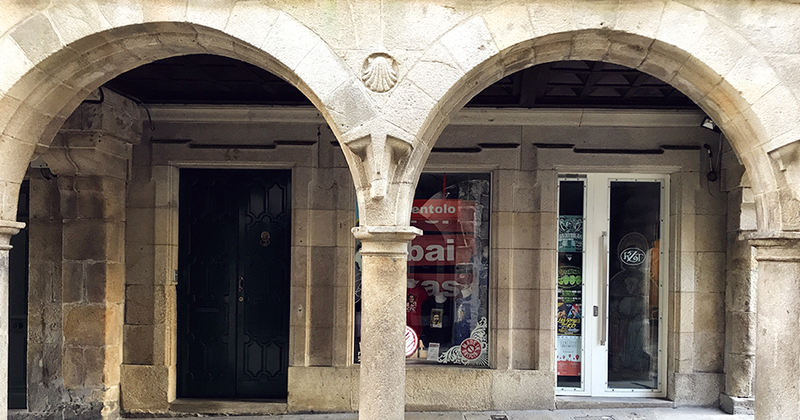 More than one visitor will have been surprised when walking through the streets of old Compostela by the presence of curious engravings on the facade of most houses. We are not talking about the large coats of arms adorning prominent families’ palaces, but of modest carvings made on walls or windows. Some represent a tree, many others a scallop shell or a chalice, and fewer a dove or a cross of Malta. What do these artistic marks on stone mean? Why can they be found in Santiago but not in other historic cities? The engravings are none other than ownership marks. That is, signs that indicated, at the time they were made, who the owner of a certain building was. Most of them were created from the sixteenth century onward, and especially in the eighteenth. It is therefore easy to imagine that, in a city in which the influence of the Church was enormous through centuries, most of them identify a religious owner. Among the most common signs is the scallop, the classic shell that everyone associates with pilgrimages to Compostela and, therefore, with the Cathedral. Indeed, the houses that bear this mark were once owned by the Cathedral Chapter, the ecclesiastical institution that gathers the priests of the Jacobean temple. They are largely present precisely in the surroundings of the Cathedral, and are most common in streets like Franco, Raíña, Hortas, Carretas … and in other roads of what once was the outskirts of Santiago, such as Sar, Olvido or Hospitalillo. It is also very common to find marks that identify the other great ecclesiastical institution of the city, which even rivalled at times the power of the Cathedral: the monastery of San Martiño Pinario. They are identified by a tree, almost always beautifully cast in the stone and sometimes with the initials S.M. around the trunk. Beyond the historic town, its presence is very important in the oldest houses in the San Pedro neighbourhood. But there are more eye-catching designs. In some streets, such as the Espírito Santo or Travesa, a dove with open wings marks the properties of the Brotherhood of the Holy Spirit, while the cross of Jerusalem, with four arms of equal size, indicates that the owner was the Hospital Real, the current Hostal dos Reis Católicos. The Calatrava cross identifies houses belonging to the dominicals in Belvís, in the area of ​​Bonaval or in the Rúa Travesa (the current soup kitchen, for example), and a shield with five stars identifies the University of Santiago assets, as it derives from the coat of arms of its founder, Archbishop Alonso III of Fonseca. The chalice, on the other hand, is a mark on which there are still doubts, although it could very well mark it as belonging to the City Council of Santiago. Meanwhile, the Brotherhood of the Conception left testimony of its holdings on several facades inscribing long texts in clear print. Playing at identifying this kind of stone-carved lease contracts is a fantastic excuse to step back onto the streets of Santiago, where so much and so little has changed in the last five centuries.